Well, yeah; Zatanna had been quite the inter-team hussy, while she was looking for pops. Don't know what they were thinking when Conway put her on the team, in her black bodysuit and elf shoes. The Blue number was a lot better, though i always preferred the classic outfit (far more than the modern revamps of it, which look a bit too "stripper," to me). Think they were making fun of Scarlet Witches old funky tiara thing (as opposed to the streamlined version she switched to). They exaggerated the thing until it started to droop. Maguire went full rabbit, in JLI. Should have had Silver Sorceress meet up with Dumb Bunny, from the Inferior 5. The final, Biblical message is understood, but it capped off a rather pointless story seemingly designed to get to this point. I guess I should add that aside from the novelty of the JLA running into "The Revengers", this was a lousy way to bring the JLA's first year of a new decade to its end. Yes, the GL bias has worn all patience down to threads, especially when one considers how plug-worthy Batman was that year, and still on an undeniably consistent ascendency from the late 60s. I guess that panel can be seen in a number of ways, but in consideration of Zatanna's place in the story, this was exactly what it was meant to be--appreciation, not two dudes getting ready to play out The Devil in Miss Jones--DC style. This neglect of Batman will be overcompensated for in an issue-long Batman plug that we will looking at a few days from now... stay tuned! It's actually three dudes; Atom is just small and hard to see, but he is hugging the front of Z's right shoulder. 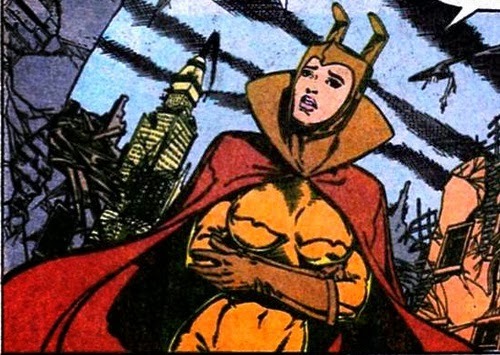 Judging by those previous images showing the heroes falling all over each other to get Z's attention, it appears that she's a winner in the "Whom do DC characters consider the most beautiful woman in their world?" In that context, the group hug seems less like appreciation for a peacemaker, and more like a pretext to touch a pretty lady. Robin just gets a "good job, sport!" handshake when he plays a similar peacemaker role a few issues from now, and Superman didn't even get that much when his gestures of peace quelled a whole planet worth of rioters in the plankton/Zappa story. The Story: In the prelude, a spaceship sails toward Earth, filled to the gills with a large number of perfect-yet-decadent humans who have never known distress and thus never developed any moral fiber. They abandoned the land of Mu when it sank into the ocean long ago, but now they are returning to claim the Earth and are annoyed to find it inhabited. They initiate a series of catastrophes on the planet surface. Hawkgirl is struck by strange lightning from a blue sky while digging up an ancient artifact on a desert island. The JLA split up to investigate clues pointing to the sunken continent of Mu. Green Lantern is struck down like Hawkgirl before he can help out, though. Superman and Atom deal with looters and panicked rioters in the Persian Gulf. A noble Iranian named Omar Ibn Ali has a fancy necklace which he smashes to placate a boatman and gain a place for his family in the evacuation. In the Mekong Delta, The Flash wages a one-man battle to hold back a monsoon. Meanwhile a Vietnamese woman, Lok Lu, has lost her family to both North Vietnamese incursions and American airstrikes. She smashes her household idol in frustration. These smashed objects were actually two of the three talismans of Mu, responsible for the natural disasters striking the world. The irate Mu-people, seeing their plan in danger of failure, take a human aboard for questioning: a surly American surfer named Peter Conk. They argue with Conk and then eject him from their spaceship, but not before he literally throws a spanner in the works. The ship takes off, crashes, and then explodes, ending the alien threat while killing hundreds (thousands?) of Mu-people. They deserved it! Happy ending! In 1971, Iran was a very westernized country whose leader, the Shah, had been reigning since 1941, when the Allied Powers orchestrated for him to replace his father and secure Iran’s oil reserves for the Allied war effort. Not until the revolution in 1979 was secular Iran overthrown and replaced with the Shi’ite-dominated society which exists today. Nor is “Omar Ibn Ali” an Iranian (Persian, thus Farsi) name; it’s Arabic. Dillin depicts Omar Ibn Ali in traditional Saudi clothing as well. All of this just goes to show that Americans have (then or now) a very fuzzy understanding of the variety of cultures to be found in the Middle East. How many of you, like me, thought that Frank Herbert was making up all of Dune’s cultural detail just out of his head? The return of the Mahdi, countries warring over a desert whose sands contain the fuel that makes the world go round, etc. But I digress. Anyway, we must give credit to Friedrich for correctly relating (through Omar Ibn Ali) the story of Muhammad’s flight from Mecca to Medina. Lok Lu, representing the plight of Vietnamese civilians trapped in a war they didn’t ask for and can’t escape, is pretty self-explanatory until the last page, which asserts that she represents the virtue of patience. She didn’t show any patience, just understandable grief at her miserable lot in life. If anything, she showed that patience has a breaking point, which she has passed. A few issues from now, Friedrich will give us a story about what happens when Vietnam sends someone over the edge. Following up on Kanigher’s story from JLA #84, Batman is still attracted to Black Canary, but she friend-zones him while rebuking Green Arrow for his presumptively possessive attitude. This has all the makings of an abusive situation. Denny O’Neil by contrast portrayed Ollie as hot-headed toward injustice, but not toward Dinah. I read Friedrich’s take on all of this as a refutation of Kanigher (shutting down the Batman-Black Canary romantic option) and perhaps a challenge to O’Neil (suggesting that maybe Ollie isn't right for Dinah, or anybody, unless he mellows and learns some humility). But I realize now what Kurt Busiek was getting at in the combo of bruised Quarrel and abrasive Crackerjack in Astro City. Yep, "So that's where canary's head is at" sounds just like the Batman I always knew and loved. The Story within the Story: Black Canary and Green Arrow are instantly transported to a quaint store in Mexico, where a mystic urn causes them to black out and experience a pair of dreams: In the first dream, Black Canary awakens to find GA gone and Superman acting like her boyfriend. The JLA are trapped in a cave guarded by a cyclops. By the time Superman defeats this guardian, it’s too late; Aquaman has died of dehydration. Superman turns into Ellis, cries in despair, and the dream ends. In the second dream, Batman saves Green Arrow from being trampled beneath the hooves of a minotaur, then reveals himself to be Ellis. Wasn’t that noble, baby? See, I foreswore vengeance to heroically save your boyfriend instead of letting him die so I could have you! Back to the Story: Later that night, Black Canary tells Ellis that she’s already dating someone else, and he apologizes for harming Green Arrow with his dream-power. They part friends, but he gives her a kiss right in from of Ollie. Back to the Frame Story: Mike Friederich’s talking head returns with a half-page monologue defending the writing of this story and explaining that that the actions of characters on the page must exist in the head of the writer, so they are aspects of his own psyche. My Two Cents: “The most unusual JLA story ever” reminds us that far from inventing meta-textual comic books, Grant Morrison is constantly recreating a common trope of the Silver and Bronze Age, with creators appearing on-page and characters speaking directly to the reader. It’s kind of daring for the text captions to invite the (mostly male) readership to put themselves in Black Canary’s buccaneer boots, imagining themselves being romanced by a suave Hollywood guy. Dennis [O’Neil] has got the fatal flaw that I think is shared by many of these fellows. They pick the wrong idols. They worship at the wrong altars. When you’re a kid and you pick for your idol Jonas Salk or Charles Lindbergh or Babe Ruth, then you’ve really got something to shoot for. When you pick for your idol Jack Kirby — I mean, as nice a man as Jack is, he’s a comics artist. He’s top of his profession, but it’s a very rarefied kind of thing, and even Jack has finally gotten out of it, into other artistic areas. But there’s a thing about your dreams when you’re a kid… In some way — I don’t know how — [Mike] Friedrich and Denny [O’Neil] and [Steve] Gerber and all of those guys got burned out in their brains. They worshiped the idols of childhood and never made the transition when they became adults to understand that success is having the dreams you had as a child but in adult terms. If when you were a kid you wanted to be a cowboy, you grew up and became a rancher — you don’t become a cowboy. If you wanted to be Superman, you grew up and became a pro football player — I mean, that’s as close as you’re going to get in this life to being Superman. Dennis is one of the nicest and finest people I’ve ever known — I’d like to think he’s a very dear and close friend — and I really weep about it sometimes, I mean not really weep, but it makes me very sad to think about it because Denny could have been anything. Could have been anything. He’s got one novel to his credit, not a good one. Dennis had the ability to really go to the top of the mountain, and you say, “Why didn’t he? What the hell’s he doing at Marvel, and what the hell was he doing at DC for 10 years?” I wish to Christ he were out of comics… I mean, God only knows whether he’ll ever be Dostoevsky, but a lot of years and a lot of visceral material has to be expended behind the typewriter before you can ever hope to be read five minutes after you’re down the hole. And Dennis has spent a lot of time writing a lot of stuff that even at its best — and Dennis to my mind is the best writer that’s come out of comics in the last 30 years. As you might expect, The Comics Journal got many letters defending the objects of Ellison’s attack; those were printed, along with Ellison’s responses, in issue #57. With that kind of Ellison vibe floating around (probably very similar in the early 70s), I can imagine this story as Friedrich hoping that Ellison will take comic books more seriously. But writing him into the story as a frustrated lothario seems likely to further antagonize a man with a very low threshold for being antagonized. Apparently Friederich and Ellison were friends, so maybe he got away with it. Yes, like all writers I use material from my past and from my experience to authenticate flavor, to make up the minutiae of my stories but 99.97% of the characters in my stories, as much as people would like to identify myself with them, in no way are those characters me. They may have some aspect of my personality but otherwise they're a fictional construct. This from a "Harlan" who named the protagonist “Harlequin” in a story about deadlines being fascist! I bet this man and woman living at Ellis’ house are real people that Friedrich knows; I wonder who. At club The Derrick, a singer performs “See Me, Feel Me” by The Who. Incredibly stupid question: how did Black Canary support herself? Being a JLAer was a paying job? I remember the post-Crisis version had a flower shop. Was the same with the pre-Crisis Dinah? Too bad the interiors could not match the typically excellent Adams cover. The Story: In the prelude, a spaceship sails toward Earth, filled to the gills with a large number of perfect-yet-decadent humans who have never known distress and thus never developed any moral fiber. 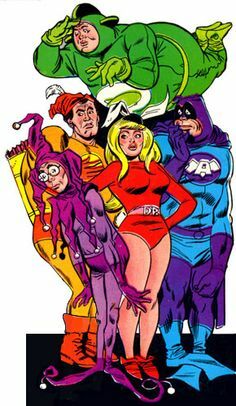 Wait--did a JLA comic from 1971 predict Millennials?? All of this just goes to show that Americans have (then or now) a very fuzzy understanding of the variety of cultures to be found in the Middle East. Well, you have to understand that outside of the West, countries do tend to have what are known as a "predominant culture," as they are not as populated by or accepting of a wide mix of cultural influences--especially those from the West. 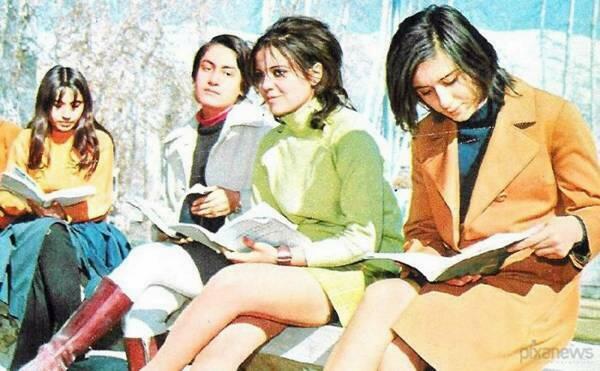 Despite that photo of Iranian women from 1971, there was and remains a predominant culture intensely tied to race, religion and gender roles that have been in place for centuries (and continue in those countries), so I would not paint the creators of this tale as being completely incorrect. Following up on Kanigher’s story from JLA #84, Batman is still attracted to Black Canary, but she friend-zones him while rebuking Green Arrow for his presumptively possessive attitude. This has all the makings of an abusive situation. Denny O’Neil by contrast portrayed Ollie as hot-headed toward injustice, but not toward Dinah. I read Friederich’s take on all of this as a refutation of Kanigher (shutting down the Batman-Black Canary romantic option) and perhaps a challenge to O’Neil (suggesting that maybe Ollie isn't right for Dinah, or anybody, unless he mellows and learns some humility). This was all wrong; its as if Friederich did not understand Batman, or had him utterly clueless about BC and GA's relationship. Further, having GA acts so possessive--almost bordering on "wife beater" behavior was also way off, like that was a natural outgrowth of the hotheaded behavior exhibited around Green Lantern. No more than H.G. Wells did in 1895. You meant to say Boomers, right?